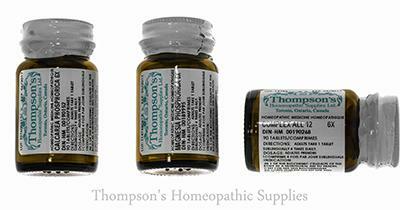 Dr. Schuessler's Tissus Remedies are available in amber glass jars, in 6x potency - 90 tablets each. In acute cases: 1 tablet every hour or two for six doses, than as in chronic cases. In chronic cases: 1-4 tablets daily. In painful affections: 1 tablet every ten to fifteen minutes for six doses, then as in acute or chronic cases. Let the tablets dissolve under the tongue, or in painful affections, like cramps and spasms dissolve 3 tablets in glass of warm water and sip slowly. The most appropriate time for taking them as a rule, is on an empty stomach 1 hour before breakfast, 1 hour before lunch, 1 hour before supper and at bedtime. When two or more Tissue Salts are needed, they should be taken in alternation. Authorities on the use of the Twelve Biochemic Tissue Salts recommend the 6x potency in general.